Justin Payette, PT, DPT, SCS, CSCS is a Clinical Assistant Professor in the Department of Physical Therapy at the University of Illinois Chicago. 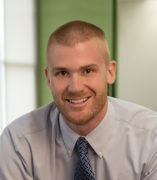 Justin received his Doctorate in Physical Therapy from Marquette University in 2010. After graduation, Justin went on to complete a sports physical therapy residency at St. Francis University in 2011. While in his residency, Justin was involved in concussion research, teaching, and care of the university’s athletes. Justin has been a NSCA Certified Strength and Conditioning Specialist since 2009, and a Board Certified Clinical Specialist in Sports Physical Therapy since 2012. In addition to his teaching responsibilities at UIC, Justin is part of UIC’s Physical Therapy Faculty Practice, and is on staff with UIC’s Orthopaedic Residency Program.